Wow...only 3 years prior to our 57-58 design...but oh, so much different. And that's a good thing! Very cool looking car...has that lead sled look. 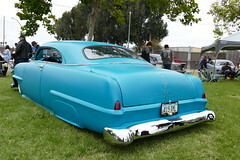 Sure would like to see more photos of your 54.